I'm reading a book, I'm trying to get started. “Little Red Riding Hood,” “Hansel and Gretel,” and “Cinderella” are iconic children’s literature, but it's forgotten that the subject matter of these and other classic fairy tales are exceedingly dark and violent—in the original “Snow White,” the Queen, Snow White’s actual mother, wants her daughter killed so she can eat her liver and lungs. From the original 1740 French fairy tale by Jeanne-Marie Leprince de Beaumont to its acclaimed animated and stage adaptations, the common narrative thread running through every iteration of Beauty and the Beast is the notion that love can tame even the most savage creature, unlocking its inner beauty. The latest version is a lavish, live-action Disney update that nonetheless mirrors the plot and songs in the 1991 Oscar-nominated film. Perhaps the patina of cel animation masked an unsettling underpinning that, 16 years hence, rings rather regressive to contemporary eyes and ears. It’s hardly politically correct to recoil from a romance spawned by a brute holding a young girl captive, positive that if she would only get to know him better that she’d learn to love him and cure his violent impulses. Our court system and women’s shelters are full of such stories. 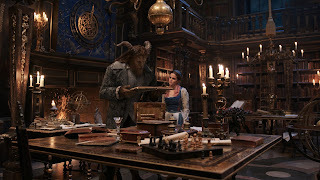 When doddering dad Maurice (Kevin Kline) wanders across a seemingly abandoned castle and picks a rose for his lonely daughter Belle (Emma Watson), a monstrous Beast (Dan Stevens underneath lots of CGI), the lord of the manor, claps Maurice in his dungeon. When Belle discovers her father's whereabouts, she bargains with the Beast to take his place. That’s just fine with the Beast and the other inhabitants of his castle, all anthropomorphic finery ranging from a candelabra (Ewan McGregor), a brass clock (Ian McKellen), a harpsichord (Stanley Tucci), and a teapot (Emma Thompson). They’re former helpers of the house encased in these animate objects, and the Beast is actually a vain prince damned to this grotesque visage unless he can convince a woman to love him before the last petal falls from a hexed rose. Belle, a bookworm branded “funny” by her townsfolk, has long rebuffed any romantic overtures, particularly the coarse advances of Gaston (Luke Evans), an arrogant would-be suitor accompanied by LeFou (Josh Gad), his long-suffering sidekick. Much has been made about this LeFou being the first avowed gay Disney character, and while Gad’s interpretation leaves little to guesswork, he doesn’t exactly play LeFou like Harvey Fierstein. Condon’s coiffed, painterly set design produces its fair share of eye-catching moments, from the opening ball to the frenzied “Be Our Guest” feast. But further hindering the parochial plotline are the two leads. Stevens’ digitized voice makes him sound like a Transformer. Meanwhile, it’s hard to decide which countenance is more devoid of emotion: Stevens’ motion-captured mask, or Watson, who simply and quite unfortunately appears bored and/or lost in the part. She wanders aimlessly through entire scenes without design, and her go-to expression is a bemused, pursed-lip smirk for a role that demands a broader mien. Together, it’s the woolly mammoth meets the woolly personality—I’ve seen better chemistry in Fifty Shades of Grey. There are the inevitable plot quibbles—the herd of snow wolves that prowl the forest encircling the Beast’s abode accost those approaching the castle as well as those attempting to escape, until the storyline needs them to mysteriously disappear. 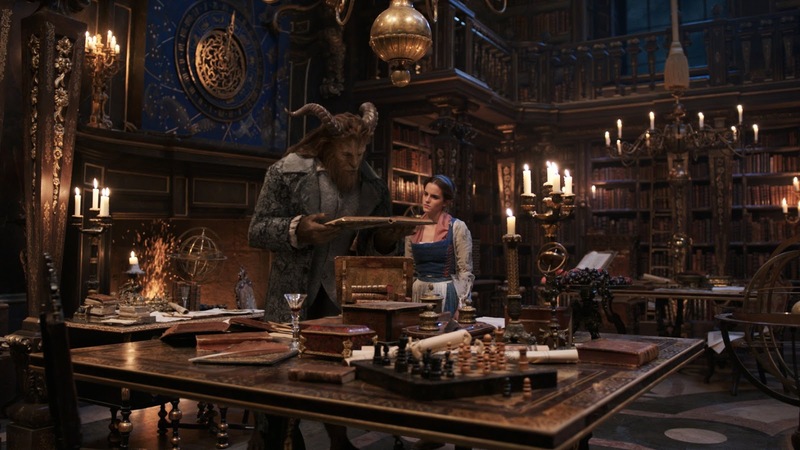 Beauty and the Beast’s insistent romance will lure susceptible viewers, but there’s little need for this revival to run a whole 45 minutes longer than the 1991 adaptation. The result is overstuffed pastiche, trying mightily to recapture the magic of a story that doesn’t age so happily ever after. I love this mythical tale. My kids enjoy it just as much. The story unfolds in typical Disney fashion in which the story captivates adults as well as children. The story delivers some personalty insight while staying light hearted.